If you are reading this article, chances are that you want to explore the market other than one platform which your app has already graced. With different user base potential, both iOS and Android platform have their share of fame and popularity to offer to an app. But due to budget constraint, many times entrepreneurs or business owners choose to launch the idea over a single platform to better understand user behaviour. After iterations of changes, the second platform comes into the picture. No wonder, the market pressure and ever evolving user demand have forced you to propel the development from one platform to another. 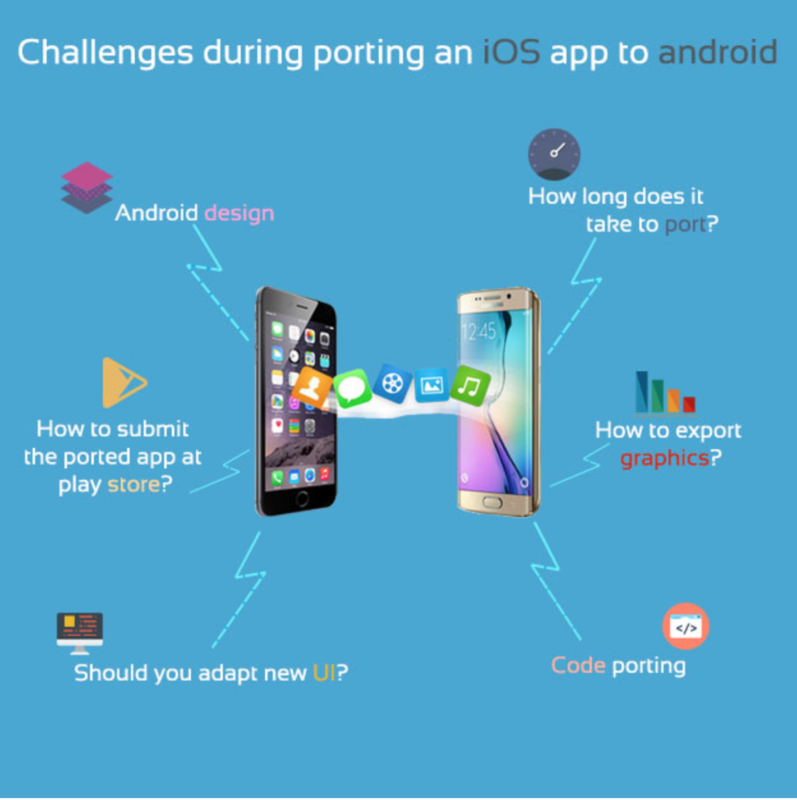 Before That we Will See, Why There is Actually a Need to Port iOS App to Android? If we see the previous year statistics, we will find that there is a significant increase in the number of android users. More and more people are showing interest in Android devices, which resulted in huge investment in Android version of iOS apps. The owners of iOS apps are discovering that they are missing out on a large market, and it is must to port iOS app to android. It is better to focus more on freemium strategies and in-app purchases rather than making it a free app. Android market is open to all and there is no restriction on what your app can do. This might affect how you want your android app to be designed. The app updates are almost instantaneous, which means there will be only a few users who are not satisfied with your app. 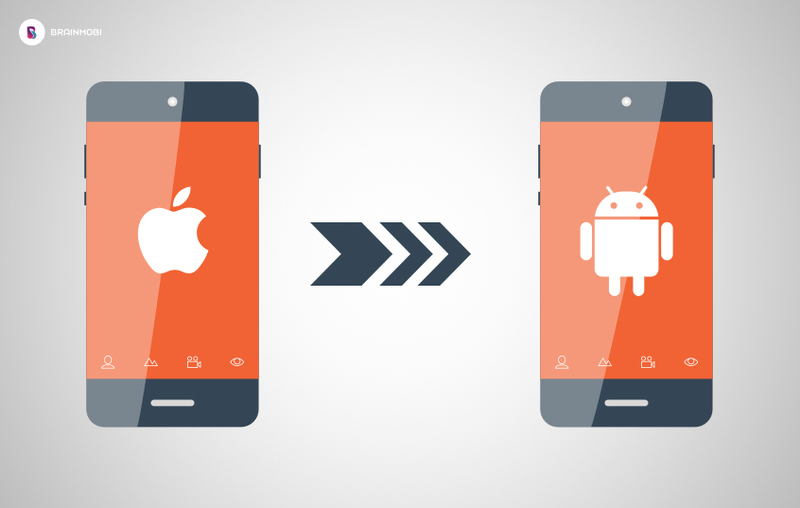 You need significant adaption when porting iOS app to android. We recommend you not to use design tools that are intended for iOS. Most of the common app design tools provide iOS templates and you may think that they fit the android platform as well. However, one should know that porting iOS app to android will lead to conflicts between the ported app interface and design of the android device. There are many contradicting features between iOS and Android, such as – buttons, lists, tabs, date/time, widgets, navigation etc. The next thing to consider is fragmentation that is derived from different screen resolutions. You should consider app’s data and graphics to be displayed both on small and large screens, considering vertical as well as horizontal layouts. Though you can ignore some of the older versions, you should consider 10% of screen resolution. Some of the popular versions of android system are – Ice-cream sandwich and android 2.X, KitKat, Jelly Bean, Lollipop and Marshmallow. Now, once you have decided to port an iOS app to android, you should consider thinking android design. The problem is that there are many iOS tools that have iOS templates and designers use them to design android apps. However, the designs conflict with the feel and look of the app. It will take a lot of effort and time to implement. Moreover, there are problem areas such as round buttons, tabs at the bottom, lists with right pointing arrows and so on. To avoid these problems, the first thing you need to do is avoid using iOS design tools. Just use drawing tools such as Photoshop, Visio, Balamiq next etc. If you want to get a quick overview of android UI, you can check the official website of Android. Google also has created a page describing how to design for pure android app. Should you Adapt New UI? With the changing algorithm of Google, it changes the way apps can be architected internally for smartphone and tablet layouts. Google provided compatibility library that allow the latest UI elements to run on new and old android devices without changing the look and feel of the app. When re-designing the app for android, you should focus on how the data and graphics will be displayed on screens of different sizes. Google strongly recommends following the UI language known as “Material Design”. This will help android audience get familiarized with common UI. Material design has a few common UI elements that have better support for developers. Android has a different graphic asset and you need to adapt your app’s graphic assets for android. This means, you need to resize, export and name new files. It can be a bit easier than exporting assets for iOS. For instance, if you are exporting .png images, you should consider grouping the assets in different sizes 1X, 2X, 3X and 568h@2X. It would be a big headache to create precisely sized assets for each android device. Hence, the best solution is to scale assets to correct size for relevant device screen. This could be one of the reasons why graphic images on android are not as crisp and beautiful as they do in iOS. The next thing to consider is the code porting, Check if it is possible to take objective-C or recompile it for android. The android apps use Java and if your iOS app uses Vanilla C, it is possible to reuse the same code for android. This is beneficial for porting complex libraries as well as to enhance the performance of the app. Some mobile app developers make the mistake of sharingembedded UI designs into the app. Sometimes, the specificationsinclude UIs that gather information to be sent to social networking apps. There is no need of such sharing for android apps. Instead, mobile app developers should consider using action_send intends to other social networking apps. This means users should be able to share to other apps and there is no need to write a separate code against server-side sharing APIs. In short, it is essential to consider which characteristics of your product are time-sensitive and use the programming tactics accordingly. Since the app has already been developed for iOS, it will not take much time to port to android. Though porting seems to be a straight forward process, it is not quick. The time to complete the porting process will depend on the complexity of the app and selection of supporting devices. Device inconsistency will create surprise for the mobile app developer, and hence even a small change will mean additional time for porting. Different devices use different hardware components which causes your device to interact with OS and hardware in an unexpected way. How to Submit the Ported App at Play Store? Once the app is ported successfully to Android, it should be submitted to Play Store in the similar way it is submitted to iTunes. You need to provide screenshots, regions, ratings and other details about the app to the developer. Go through the guidelines of submitting the app to Play Store. Google will review your app and approve or reject it on the same day. There are many mobile app developers who have huge experience of porting iOS app to android. To bring amazing results, the template for app porting should have – adaptation plan formula, UX testing, source app business logic analysis, proper coding & testing, etc. At BrainMobi, we have ported several apps from iOS to android and have huge experience in android and iOS development. The porting process can be a smooth sailing, if you understand how to prepare the assets for Android before you start! !